On June 3, we made up for missed programs with a two-hour special dedicated to my niece, Annie Walton-Teter, recovering from a boating accident that could well have proved fatal. A heartfelt mahalo to the Coast Guard crew who last weekend effected a heroic rescue at night in high seas, 70 miles off the California coast. For heart-stopping video from the chopper, follow this link. The following notes cover two weeks' worth of "Catch of the Day." As regulars know, we air on the first and last Sundays of each month, skipping the weeks in between. From here on, I'll be batching recaps of adjacent shows, in omega-alpha order. 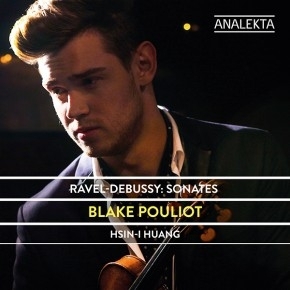 Blake Pouliot, violin, Hsin-I Huang, piano. In his debut album, a Canadian top grad from this year's class at the prestigious Colburn School in Los Angeles achieves a delicate balance between classical polish and rock-star showmanship. "Fire Dance," from The Shaman: Concerto for Percussion and Orchestra. 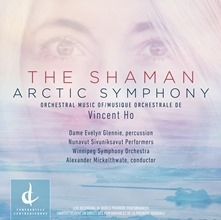 The Shaman/Arctic Symphony: Orchestral Museum of Vincent Ho (Centerdiscs, 2017). Dame Evelyn Glennie, percussion; Winnipeg Symphony Orchestra; Alexander Mickelthwaite, conductor. An infectious primordial rumble for the long circumpolar night, sparkling with ragged torchlight and showering embers. 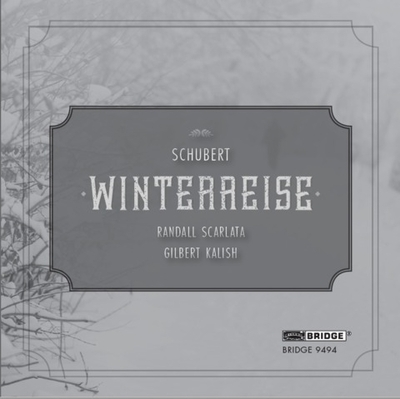 "Erstarrung," from Franz Schubert, Winterreise (Bridge, 2017). Randall Scarlata, baritone, Gilbert Kalish, piano. Will Scarlata's reading take its place beside historic reference recordings of this incomparable cycle? Don't bet on it. But his heart-on-sleeve despair gets under the skin. So much so that we gave him an encore: "Die Krähe," eerie and hovering with exhausted foreboding. "Birdsongs for Eric (Eric Dolphy)." Diane Moser: Birdsongs (Planet Arts, 2018). 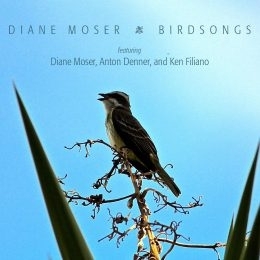 Diane Moser (piano), Anton Denner (flute, piccolo), Ken Filiano (contrabass). Bouncy, straight-ahead classic jazz. Influence of natural birdsong undetectable. "Forest Murmurs" (from Siegfried, Act 2). 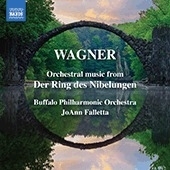 Wagner: Orchestral music from Der Ring des Nibelungen (Naxos, 2018). Buffalo Philharmonic Orchestra; JoAnn Falletta, conductor. Arguably the most luminous pages from Wagner's sprawling epic, rendered intimately, as it were in pastels. "A Walk to Caesarea," David Zehavi (arr. : Boris Pigovat). Breaking the Silence (Klanglogo, 2018). Rounding out a program of music by composers suppressed or murdered by the Nazis, a muted, contemplative evocation of the Holy Land. 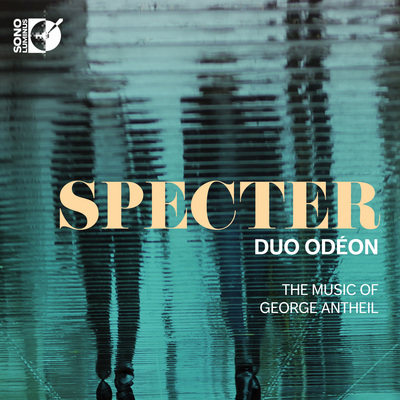 "Valses from Specter of the Rose," George Antheil (arr. : Werner Gebauer). A notorious avant garde "bad boy" channels Ravel without in the least scaring the horses. And here I was anticipating some wild take on Carl Maria von Weber's exhilarating "Invitation to the Dance," the inspiration for Michel Fokine's iconic Le Spectre de la Rose for a petal-clad Vaslav Nijinsky. Nonelective affinities? 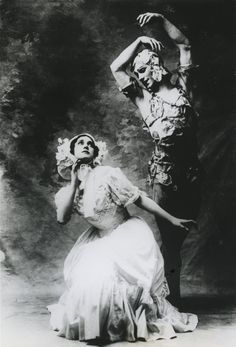 Vaslav Nijinsky as the Spectre of the Rose, with Tamara Karsavina. 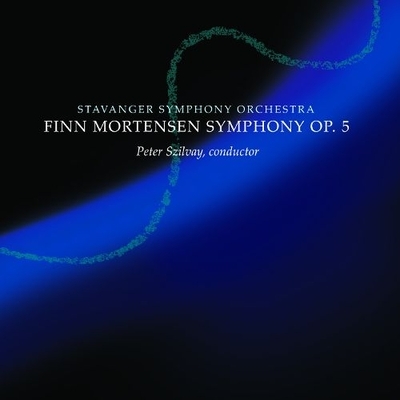 Finn Mortensen, Symphony Op. 5 (SSO, 2018). Stavanger Symphony Orchestra; Peter Szilvay, conductor. In this opening movement of his early, rarely performed, and only symphony, a renowned Nordic modernist harks back to the cusp of post-romanticism, evoking the sound world of Mahler and Bruckner, minus ecstasies and neuroses. There is at least one other recent recording of the piece, but this one, by one of Norway's most ambitious regional symphonic ensembles on its own label, presumably has the home-team advantage where authenticity is concerned. Strong Sad (National Sawdust Tracks, 2018). 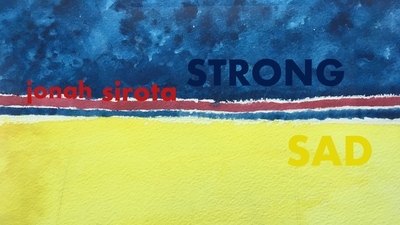 Jonah Sirota, viola; Kurt Knecht, organ; Molly Morkoski, piano; Nadia Sirota, viola. If I have this right, the composer put together a "map" for this piece, consisting of bits of sampled music. The soloist then improvised his part, whereupon the composer jettisoned the underlying collage and wrote a new accompaniment. The resulting meditation seems constantly—but gently, nervously—to be pushing doors one scarcely realizes are there. "Till Eulenspiegel einmal anders!" Franz Hasenöhrl, after Richard Strauss. Trimmed to half its length for violin, clarinet, bassoon, horn, and double bass, Strauss's big-band spectacular Till Eulenspiegel's Merry Pranks emerges as a nimble divertissement, deliciously played. 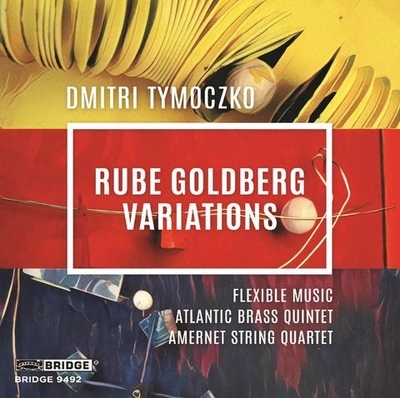 Dmitri Tymoczko: Rube Goldberg Variations (Bridge, 2017). Atlantic Brass Quintet with John Blacklow. Occam, you may remember, had his razor, handy for slicing complications away to reveal an idea's simplest essence. The cartoonist Rube Goldberg worked the other way around, inventing diabolically intricate machines to accomplish the most trivial tasks. Tongue firmly in cheek, Tymoczko devises interlocking lines that are witty, propulsive, and infectiously listenable. Nocturne in F-sharp minor, Op. 6, Dinu Lipatti. 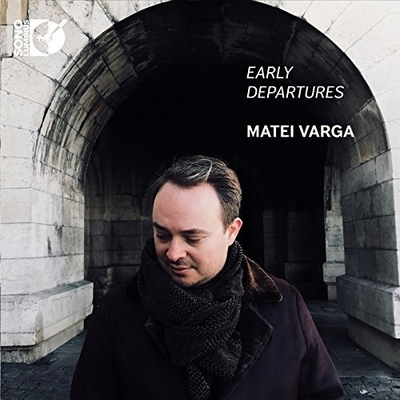 Early Departures (Sono Luminus, 2018). Only 33 at the time of his death, Dinu Lipatti, of Romania, had achieved enduring world renown on the strength of some three-and-a-half hours of piano recordings, widely adjudged "pure gold." His ambitions as a composer went unfulfilled. Here a countryman honors Lipatti's memory with what turns out to be a wan exercise in an exhausted genre. 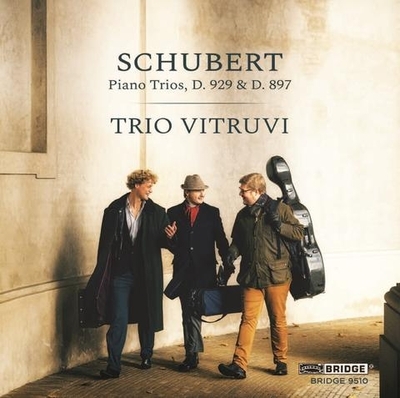 Schubert: Piano Trios (Bridge, 2018). Despite robotic strings and topsy-turvy balances favoring the keyboard, something of the rapt serenity of this celestial adagio does come through. 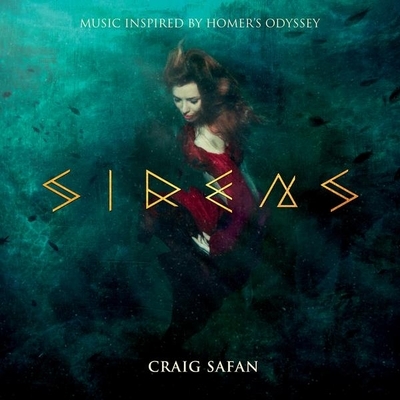 Craig Safan: Sirens, Music Inspired by Homer's Odyssey (Varèse Sarabande, 2018). As one who swims daily in waters where resident dolphins might surprise us any day, I could hear nothing in this chugging, jazzy music to suggest their speedy, buoyant grace. That spoiled it for me. Movement 3: Adagio sostenuto, "Hammerklavier" Sonata, op. 106, Ludwig van Beethoven. 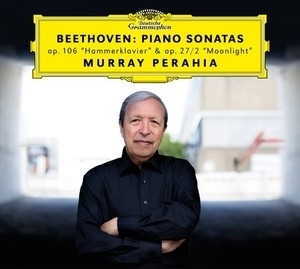 Beethoven: Piano Sonatas op. 106 and op. 27 (Deutsche Grammophon, 2018). One of the supreme moments of the piano literature, monumental in design yet exploratory in the unfolding, laid out with transparency, concentration, and a magisterial absence of ego. 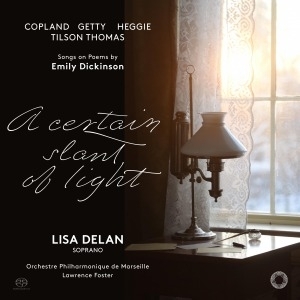 A Certain Slant of Light, Songs on Poems by Emily Dickinson (Pentatone, 2018). Lisa Delan, soprano; Orchestra Philharmonique de Marseille; Lawrence Foster, conductor. We heard—in performances shiny as new pennies—the miniatures "Going to Heaven!" (Aaron Copland), "I'm Nobody! Who are you?" (Jake Heggie), "The Earth Has Many Keys" (Michael Tilson Thomas), and my surprise favorite, "Because I Could Not Stop for Death" (Gordon Getty). Each of the album's composers (all Americans, all but one living) catches something essential of the poet's darting mind and pose of impertinent caprice. In addition, Getty tells a story and paints a picture. "The Carriage held but just Ourselves – And Immortality," the Belle of Amherst writes, and in the song, we see that carriage, charging into into the beyond like Cinderella's en route to the ball.